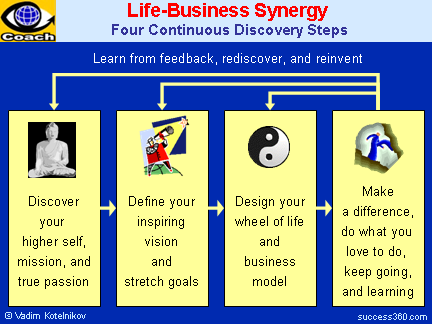 Happiness is not about life-business balance, it's about life-business synergy. "Choose a job you love, and you will never have to work a day in your life," taught Confucius. “Do what you love to do and make a difference,” advised Steve Jobs, founder of Apple. Successful people win because they love what they do. Actually, your noble passion is your mission. If you find your true passion and devote yourself to it, you’ll find harmony and happiness in your life and business. You’ll be achieving great results continually and effortlessly. Your vision performs both a directional and a motivational function. The purpose of your vision of a desirable future is to inspire, provide direction, and focus you on those things you could do now to bring that future state about. Set stretch goals on your journey to your vision and your true self. Stretch goals energize and push you to work harder at meeting more difficult targets and to achieve more than if you had set an easier goal. “For true success ask yourself these four questions: Why? Why not? Why not me? Why not now?” advises James Allen, the author of As a Man Thinketh. Success is about persistent, consistent action. Action is the key. If you do not take action you will achieve nothing. So, set stretch goals and take action. Balance action and reflection – reflection of where you are now and action of pushing toward where you need to go. Feedback is the breakfast of champions and the foundation of success. It will help you learn and do better next time. Take notice of feedback in all its forms. Pay attention to detail. If what you are doing is working, find out the ingredients and sequences, then repeat them to get more of it. If what you are doing isn't working, be inventive – do something different.